This piece was the reason I was at the sculpture park in the first place. 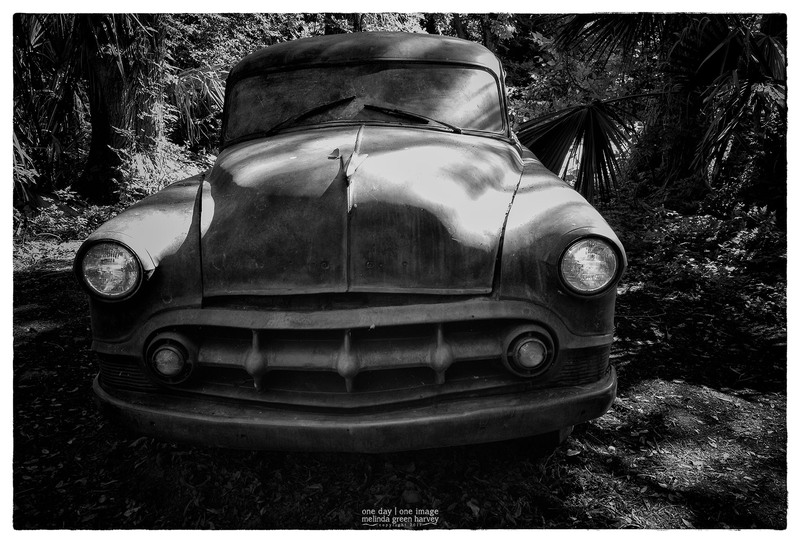 It’s by the modern Renaissance man Terry Allen and is a bronze cast of a 1953 Chevrolet coupe and gives every appearance of having just careened off a narrow West Texas road into the woods of Austin. And the headlights are on. Posted on June 3, 2017, in Photography and tagged "Road Angel", 365 photo project, Betty and Edward Marcus Sculpture Park at Laguna Gloria, black and white photography, learning to see, Leica, melinda green harvey, monochrome, one day one image, photo a day, photography, postaday, sculpture, Terry Allen, texas, thoughtful seeing. Bookmark the permalink. 2 Comments. Superb image with so much detail in the shadow areas. Suggestive of a shark’s mouth? Thanks, Andy. The dappled light made it a little bit of a challenge to shoot. Also, I had to shoot between busloads of bored school kids. The grille does look like a shark’s mouth, or something equally menacing.